That's not an ordinary hoodie - that's a state for your spirit! Do you feel a flow of life energy inside? open your wings and fly! Becom an angel today! 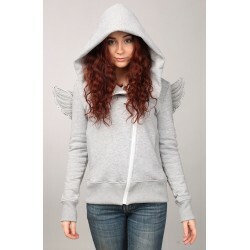 The hoodie is made of footer, amazingly soft and natural cotton. Initially, the cotton has been made as an alternative of wool, but more breathing and less moisture absorbing. It has a unique feature - it keeps the warmth despite being wet. thank you for my custom made yellow angel hoodie!!!! Took a very long time to get here but couldn't be happier with the actual product-fits great, comfortable, and looks adorable! Thank you so much!